3) Brunei National Road Race (September). 2) Powerman Malaysia in October. It seems that I did not do much of running last year but after participating in BIBD CE ALAF 42km Marathon run, I’ve started running actively again and have registered a few running events in Malaysia and Singapore. Actually from January to April 2014, I’ve registered 4 events already. Ever since making new friends with BIBD CE ALAF 25 Marathon runners, coaches and pacers, I’ve begin to enjoy running again. We have a WhatsApp group for the 25 runners and everyday, someone will update how many kilometres they have ran today. For me, with the constant updates, I felt left behind and need to run so that I can keep up or try to keep up with them. In other words, it keep me running and running and running which is good. I’ve also decided to try set a new personal best time for my marathon run. 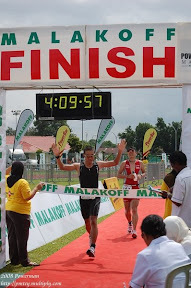 My current record was 4:58:06 hours set during Borneo International Marathon 2012 in Kota Kinabalu, Sabah. I’m aiming for sub 4:45 hours during the upcoming 2XU Compression Run in March 2014. Keep on running and stay away from injuries……………………………..